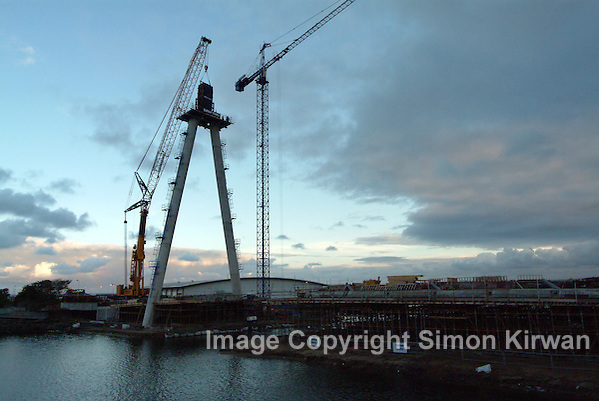 Southport Marine Way Bridge Construction September 2003 – Photo By Simon Kirwan. Ten years ago, Balfour Beatty installed the girder on the pylon of the Marine Way Bridge in Southport. The lift took place at 7 o’clock in the morning on 24th September 2003, due to high winds on an otherwise perfect day on 23rd September. This entry was posted on Monday, October 28th, 2013 at 3:18 pm. It is filed under Architectural Photography, News and tagged with Balfour Beatty, bridge, building, construction, Marine Way, photograph, photographer, photography, Simon Kirwan, Southport, Southport photographer. You can follow any responses to this entry through the RSS 2.0 feed.